Farmhouse in Lizant, Civray, Vienne, Poitou-Charentes, France - Peaceful Location, Set In An Acre Of Private Gardens. Ideal Location For Cycling And Walking. We are three generations of a family, originally from Suffolk. Grandma and Grandpa bought the house in 1991 when they retired from teaching and we have all been enjoying it (and renovating it in the early years) ever since. Why this location? We already knew the area and found the countryside charming and peaceful. Yet the house is not isolated: it is in a hamlet of three houses and most of the shops and services you might need are to be found in the nearby village or the small towns of Civray and Ruffec, just ten minutes drive away. It is close to main road, rail and air links and a comfortable day’s drive from the Channel ports. The area offers all kinds of activities and entertainments, everything from a picnic and swimming in a local Plan d’eau (water park) to a day out at Futuroscope. It is especially good and safe for walking and cycling. No 2 Peuliard was bought twenty-six years ago as “a project”. A realistic forecast, as this old fermette, though mostly sound, was very primitive and seemed to be slumbering quietly, enclosed in its acre of neglected garden and meadow. Alongside it was an attractive valley and all around was farmland and woodland. Over the years we have restored it into a very comfortable family holiday home, carefully keeping original features like the stone-flagged kitchen floor. At the same time we have made many friends and enjoyed joining in local village life. 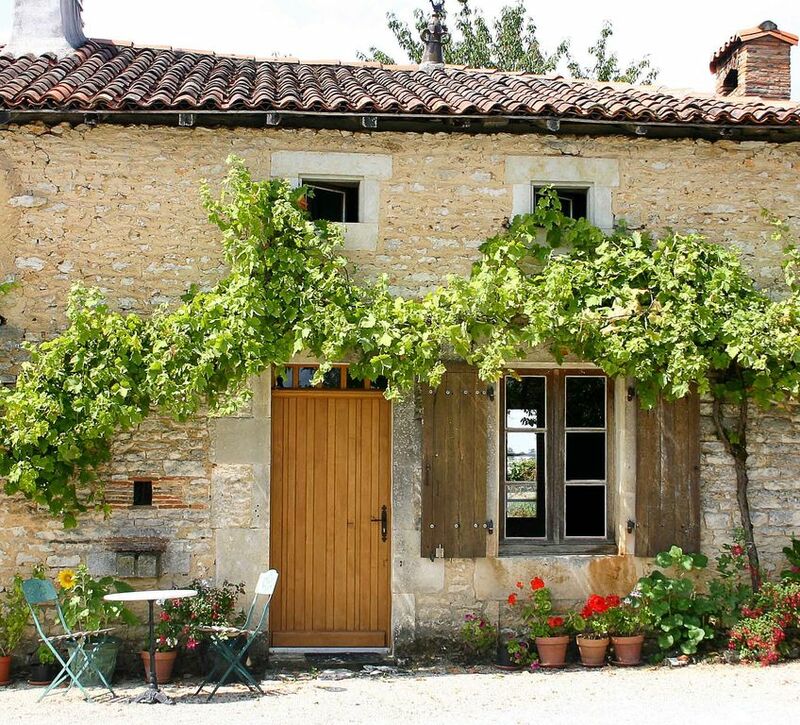 We have had a lot of fun and a lot of help from our grown-up children who now bring their children to enjoy the simple pleasures of French country life. Ground floor wet room and separate WC. 1st floor bathroom/WC with over-bath shower. 4G wifi connection with strong signal, free for guests up to 5GB per week. Unfortunately this is the maximum the network will give us. Generous living/dining room with wooden floors and French windows to terrace. The fireplace, with wood burning stove, is surrounded by comfortable sofa/chairs. There is a large dining table at one end of the room, which can seat up to 12 people. There is a TV, showing French terrestrial TV and connected to the DVD player. Outside terrace with dining table and seating for 12, plus fire pit. 10m x 5m swimming pool, approximately 90cm deep in shallow end. 2m deep in deep end. The pool is fenced with a lockable gate. The perfect house for a family getaway. I booked this house for a family holiday holiday to celebrate my Mothers 60th birthday. There were 5 adults, and 2 children. It really was just perfect. The owners have obviously put a huge amount of effort and time into renovating the property. It has such a homely feel and we all said how easy it was to relax. The rooms are spacious and we had everything we needed from kitchen utensils to fun garden games. The little touches like children's toys and DVDs to suit all the family were just brilliant. The pool and massive garden were a bonus! We enjoyed lots of time playing games outside and even a BBQ one evening. The location is idyllic and quiet and the region is just beautiful. We found some great walks to go on from the house. We enjoyed visiting the markets in Civray and Ruffec and consumed far too much cheese and wine during our stay! Ben, the owner was quick to answer any questions leading up to the holiday and was easily contactable. We wouldn't hesitate to return again and would highly recommend. An absolutely wonderful holiday with lots of laughs and great memories. We had a fantastic time here! We went with 2 children, aged 4 and 7, and 4 adults, and it was perfect for us. The house was clean and well equipped with everything we could possibly need, from extra towels for the pool, to books and games (indoor and outdoor!) to salt, herbs, spices and even ice! The welcome pack including local wine, bread, local honey, pasta, milk and butter was very much appreciated. It was very peaceful and the pool was absolutely lovely! La Peuilard was an ideal house for a large family gathering of 7 adults and 3 children. The pool, table tennis table, tyre swing and space for cricket were well utitlised! We were able to use the outside table for all meals, and found the kitchen very well equipped. We all were extremely comfortable and happy and thoroughly enjoyed our week! Fantastic house in a beautiful location! We enjoyed our stay and thinking about coming back . We loved everything about the house and the surroundings. From charms of the old farm house to the well equipped kitchen , from privacy of the swimming pool to the locks on the gates to the pool (very useful if you have small children). All ready thinking about booking it for the next summer. Poitiers airport 50 mins drive, La Rochelle about 2 hours, Limoges airport about one and a half hour's drive - all served by Ryanair from Stansted. Bordeaux airport is 2 hour's drive - British Airways fly from Gatwick. St Malo is 5 hour's drive. Calais and Boulogne approx 7 hour's using new A28 making it auto route virtually all the way. Car hire essential. Lizant, with bakery and bar is 2km away. Genuoille, another village with a free tennis court, is 3km away. The nearest towns are Civray (8km) and Ruffec (12km). Both have a variety of supermarkets, open daily. The property lies about 50 mins from both Poitiers and Angouleme, for a wider range of shops. There are many things to do in the local area: river/lake swimming and canoeing areas, 'Go Ape' style adventure park, cycling and walking trails, animal parks/monkey sanctuary. Futuroscope theme park is 50 mins drive on the N10 towards Poitiers. we have an information folder at the house with more details about local activities, restaurants etc.